On a raw, rainy afternoon in Verona, Italy, this past November, a polyglot gaggle of photo-snapping tourists unfazed by the weather jammed the courtyard of Verona’s 14th-century Casa di Giuletta, supposedly the home of the real-life inspiration for Shakespeare’s Juliet. Down a side street just three blocks away, was a far superior attraction that most presumably missed: Saporè DownTown, an intriguingly experimental contemporary pizzeria that hours later was so packed with locals there was a one-hour wait. And that despite the fact the place had not even appeared yet on Google Maps. I almost missed it too — spotting an online mention minutes before hopping a bus from Verona to San Martino Buon Albergo, the small town nearby where 51 year-old chef Renato Bosco opened the original Saporè in 2006. It has since appeared on several best-pizza-in-Italy lists and made him a nationally recognized chef. “Saporè” is an amalgam of the Italian word for flavor and Mr. Bosco’s nickname, Rè. But it’s a bit of a misnomer: he is more obsessed with crunch and pliability, lightness and heft. In other words, he is a crust man, whose years of experimentation have rendered a wild range of results, including some that are definitely pizza and others that are rather out-there interpretations. The menu is only in Italian, but patient, bilingual servers helped my party of two plow smartly through much of the menu in two meals. 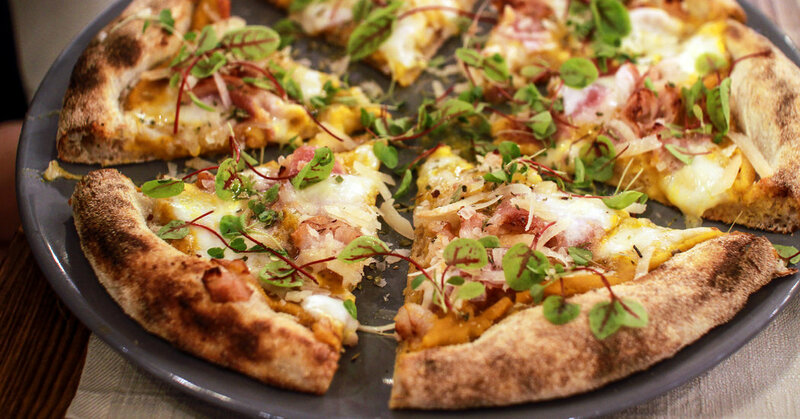 We were especially enchanted with the no-added yeast “Pancetta” pizza, which came slathered with pumpkin cream, dolloped with mozzarella, studded with pancetta cotta and topped with generous shavings of nutty, sharp asiago stravecchio. Mr. Bosco told me that he used the pumpkin cream to please the “many people” who do not like tomato sauce. I love tomato sauce and didn’t miss it at all here. Another winner was the “Tatin Cipolla” in the rectangular “PizzaCrunch” category. (You can likely guess that style’s distinguishing feature.) On top is a gloriously messy, multi-textured heap of red onion, radicchio, asiago and chopped hazelnuts. “La Classica Sempre Buona,” in the aria di pane section, features burrata dripping out from under 30-month aged prosciutto as if it were melting ice cream. It is both Instagram-ready and delicious. Drinks are an afterthought (though there is a short but varied Italian beer list), but dessert is not: don’t miss strudel-in-a-glass, a version of that pastry from the northern semiautonomous Trentino-Alto Adige region of Italy deconstructed into layers and tweaked, with welcome additions like ricotta foam and pistachio mousse. Back to the main act: some of the more out-there creations might not be for everyone. The glistening, fatty slices of tongue topping a mozzarella di pane filled with celery-carrot cream was not my style and we didn’t (dare to) try the PizzaBagels, their dough boiled in water aromatized with curry, Amarone wine or barbecue sauce. “I believe very much in the importance of confrontation and exchange with cultures different from mine,” Mr. Bosco said. You can say that again. Saporè DownTown, Via Amanti 8; 39-45-803-2221; boscorenato.it. An average meal for two, without drinks, is 40 euros (about $50).